For many Arabs, Iran is an Islamic dictatorship that is deviously trying to manipulate the internal politics of many Arab countries from the Gulf States, particularly Bahrian to Iraq, Lebanon, and Syria. For others, it is a Muslim country, a patron for the “resistance” against Israel that Arabs should build bridges with to counter the US influence in the region. There is also a third group that has a very ambivalent attitude toward the Persian state. This group shares the anti-Israeli feeling of the Iranian leadership and want to seek a balanced relationship with Iran, but are afraid of the spread of Shia Islam and resent Iranian support of the Assad regime in Syria. Egypt falls in this third category. Despite that many Arabs talk about Iran in one way or another on a daily basis, many have actually put fourth efforts to follow the internal politics of Iran, and its coming presidential election. This Arab, and particularly Egyptian indifference is unwise to say the least for two reasons. First, the upheaval in the Levant, in which Iran is a main player, will have direct ramifications on the entire Arab world as well as on Egypt. Second, Iran, which had its Islamic revolution 36 years ago, is evolving quickly and experiencing many micro changes on the social and political levels. Although the 2009 green revolution has failed to produce the desired change, society has moved on to a post-Islamism era that is full of power struggle behind the closed doors of the Mullahs and revolutionary guards. Therefore, I think we all should pay attention to the Iranian election as its outcome will contribute to the future of the Middle East immensely. This contribution will either flam the already explosive situation and cement the big Sunni-Shia divide or calm the flame of hatred and reach a possible compromise particularly on the Syrian front, which in return will affect future relationships with Egypt and many Gulf states. AKBAR HASHEMI RAFSANJANI: The centrist Rafsanjani, an important figure since the 1979 Islamic Revolution, was president from 1989 to 1997. He earned the ire of hardliners after he sided with reformists during the unrest that followed the disputed 2009 election, and has seen two of his children jailed in recent months. Here is an in-depth BBC profile of Rafsanjani, the “pragmatic conservative,” who was featured in the Millionaire Mullahs section of the Forbes Rich List in 2003, also another Reuter’s piece about him. HASSAN ROHANI: A moderate Muslim cleric, he also served as Iran’s nuclear negotiator, presiding over talks with Britain, France and Germany that saw Tehran agree to suspend uranium enrichment-related activities between 2003 and 2005. He is seen as close to Rafsanjani. (There were reports earlier today that Rohani may quit , but it was later followed by firm denial from his election campaign). Here is a Huffington Post’s piece about Rohani. MOHAMMAD BAQER QALIBAF: A former police chief, he is the current mayor of Tehran and has a reputation as a competent, charismatic manager who could attract Iran’s sizeable youth vote. He is viewed as a pragmatic conservative. GHOLAM-ALI HADDAD-ADEL: A former parliament speaker and relative of Khamenei by marriage, he is a close adviser to the Supreme Leader. MOHSEN REZAIE: The veteran politician and former Revolutionary Guards commander ran in 2009 against Ahmadinejad and lost. He is the secretary of Iran’s Expediency Council, which advises Khamenei. There are also other candidates, including Ebrahim Asgharzadeh considered as a reformist, and an advocate of improved relationship with the United States. So many candidate to follow in the Iranian election, however, Rafsanjani is seen as a strong contender, and, if he wins, the June election (still a big if) it could potentially be a true “game changer” in the wider Middle East and the Levant. His pragmatism, and long experience will have a major impact and “could” help break the current deadlock in Syria. 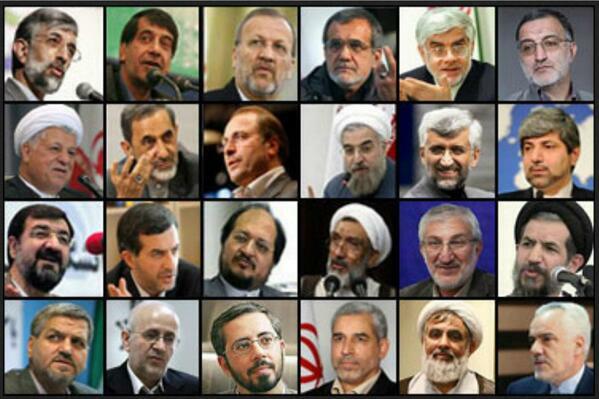 This entry was posted in Iran and tagged #Iran, #Syria, Jalili, Mashaie, Rafsanjani. Bookmark the permalink.